Performers include: Robert Beltran, Roxann Dawson, Jennifer Lein, Robert Duncan McNeill, Kate Mulgrew, Ethan Phillips, Robert Piccardo, Tim Russ, Jeri Ryan, and Garrett Wang. This sci-fi drama is the third live-action series in the Star Trek franchise. The series follows Voyager, a Federation starship under the command of Captain Kathryn Janeway (Kate Mulgrew). In the pilot, the ship is pursuing a rebel Marquis ship when both are flung 70,000 light-years from Earth. The ships’ crews must work together to find a way back home. 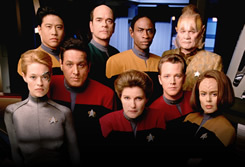 Crewmembers include First Officer Chakotay (Robert Beltran), Vulcan security chief Tuvok (Tim Russ), half-Klingon/half-human engineer B’Elanna Torres (Roxann Dawson), helmsman Tom Paris (Robert Duncan McNeill), operations officer Harry Kim (Wang), Talaxian chef Neelix (Phillips), Ocampan medical aide Kes (Jennifer Lien), a Borg (Jeri Ryan), and a holographic doctor (Robert Picardo). In the year 2404, Earth celebrates the tenth anniversary of Voyager’s 23 year journey and return to Earth. An elderly Admiral Janeway decides to go back in time, give her younger self some future technology to escape the Borg, and make it possible for the ship to return to Earth sixteen years earlier, without a major sacrifice. The plan is hindered by the younger Janeway’s desire to use the technology to cripple the Borg instead. The Admiral confronts and tricks the Borg Queen, devastating the collective and allowing Voyager to make a run for Earth. First aired: May 23, 2001. Kathryn Janeway, now an admiral, appeared briefly in the film Star Trek: Nemesis. The film focused primarily on the Star Trek: The Next Generation cast and presumably took place within a year or two of Voyager’s return. Voyager adventures have continued in novels and books (both taking place prior to and after the events in the final episode) but there’s been no news of reviving the series characters in television and movies. • In the series finale, Janeway gives Tuvok a picture of the Voyager crew. It’s actually a fifth season promo photo. • Allan Kroeker directed the series finales of Star Trek: Deep Space Nine, Star Trek: Enterprise, and Star Trek: Voyager. • French Canadian actress Genevieve Bujold was cast in the role of Captain Nicole Janeway but quit on the second day of filming. Mulgrew was chosen to replace Bujold as captain after a second round of auditions. The captain’s character was subsequently renamed Kathryn Janeway. • Characters from Star Trek: The Next Generation appeared on Voyager. They include William Riker (Jonathan Frakes), Geordi La Forge (LeVar Burton), Deanna Troi (Marina Sirtis), Reginald Barclay (Dwight Schultz), and Q (John de Lancie). Hiraku Sulu (George Takai), Janice Rand (Grace Lee Whitney) and the Klingon Kang (Michael Ansara) from the original Star Trek appeared in flashbacks. Star Trek: George Takei Gets Back into Uniform… for the Census? Star Trek: Which Are Your Favorites? Frasier: A Cast Reunion? How About Star Trek?